EA listened to its critics and delivered what they asked for with Return of the King. If last year's romp gave players the genuinely first respectable Tolkien experience in game form, this year's game cranks the volume, dare we say, to 11? Good God. But that IS what's happening here. The newly added features -- from the co-op play to the interactive backgrounds to the addition of more playable characters -- make it happen. Following the formula set forth in Lord of the Rings: The Two Towers, the first two levels of Return of the King are set in the previous movie. 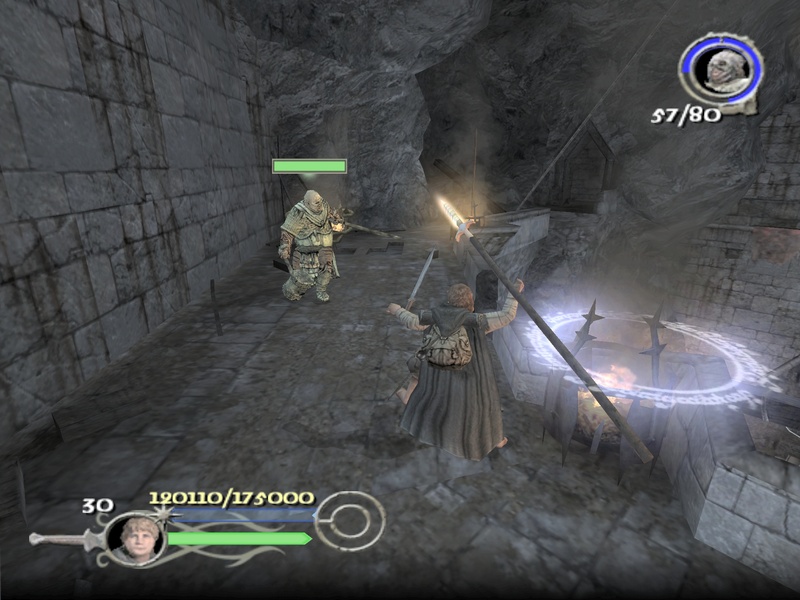 To set matters straight (for the fans, of course), players start off playing as the newly whitened wizard Gandalf in last stage of the Battle of Helm's Deep. The invisible tutorial reminds players of the simple move set (Quick and Fierce Attacks, Parry, fire an arrow or flaming pigeon of Umothali (just kidding)), as well as new possibilities, such as climbing ropes, interacting with catapults or hurling spears.